How long should a research last? Nearly 5 years on my trusty flight pillow is still going strong, it lies around the house and I use it when I occasionally find a few minutes to watch TV in bed. It's fair to say that my hair transplant not only gave me back my hair, it also indirectly cured my neck ache. Hi Markee, I take it you are in Florida so the time taken for you to get to India will depend on your chosen route. You should look at flying into Delhi or Mumbai where you can get many connections to other cities for as little as $20 each way depending on timings. If you fly via Europe then you are looking at at an average of 18 hours flying time. On top of this you need to add in transfer times, wait times etc. To break it up you could stop off in Europe for a day or so and make a little adventure of your journey. So about 10 hours into Europe (8.5 - 9 hours to the UK) and 8 hours to India (8.5 - 9 hours from the UK). You could save some money if you don't mind multiple stops. Also there are many China Airlines which offer cheap quality flights with a few hours transfer delay in one of the major Chinese cities. If you PM message my colleague, California, I'm sure he'll be able to advise you more specifically. If you have an Indian travel agent nearby (every city has at least one), then you could pop in and see if they have any hidden travel gems. I used Rogaine liquid for a number of years prior to my own surgery and I hated it, greasy horrible sticky stuff, but I think it may well have improved since. Following my own transplant I used the foam version which was completely different, non greasy, less irritable as the good Dr Bloxham has already pointed out and it actually helped style the hair unlike the liquid form which just guaranteed yet another bad hair day! I think it served its purpose; I did make a conscious effort to massage it into my scalp at the time which is a possible reason why its effectiveness may vary from patient to patient, perhaps its just not being applied properly. I get quite a few patients who find the liquid form just too irritable, it may be because of the alcohol content so they switch to the foam version with no complaints. Hi Raj, I'm sure it'll all go well for you today, I wish you all the best. Paddy, the same technicians are present today that were present when I had my own surgery done nearly 5 years ago. As my colleague California stated there is an extremely low staff turnover at the clinic. If you wish I can hook you up with an Irish patient or two so you can speak to them about their own experiences.You could even join me on my September trip if you wish, that's if your good wife will trust you to go without her! UK https://www.amazon.co.uk/Aidapt-Support-Cushion-Travelling-Eligible/dp/B00CYDIFYY/ref=sr_1_3?keywords=Memory+Foam+Travel+Neck&amp;qid=1556053738&amp;s=kitchen&amp;sr=1-3 USA https://www.amazon.com/Travelmate-Memory-Foam-Neck-Pillow/dp/B004UB056E/ref=sr_1_49?keywords=memory+foam+travel+pillow&amp;qid=1556053940&amp;s=gateway&amp;sr=8-49 I'm not sure where you are but one of these or similar will suffice. Go for memory foam for extra comfort rather than the inflatable type which will do your head in! Get it before you fly out, it'll cost triple+ at the airport. Dear all, I will be taking a group of patients to Chandigarh, India in late September this year which promises to be another memorable journey for all. We will be flying out on Friday 20th September from Birmingham, UK on a short flight to Amsterdam where we will be staying the evening to enjoy an evening out which should be a great opportunity for the group to relax and get to know each other better. I know many long haul international flights (US, Canada, South America) stop at Amsterdam’s Schiphol Airport so it’s good opportunity for our follicular challenged international friends to break up their lengthy journeys and join the group too. As for our fellow Europeans, again you are all most welcome; getting to Amsterdam for you guys is a breeze. The flight next day, Saturday 21st early pm takes us direct to Delhi in less than 8 hours, real easy, no messing about. Once in Delhi we have a short wait for a connecting flight to Chandigarh (flight duration 55 mins) or I might book a luxury taxi(s). We will then stay in Chandigarh and the surrounding area for 6 nights where myself and Dr Bhatti will organise various things to do that will fit around group members’ surgeries and recovery times. It will be a fun packed memorable trip, that I can promise. We will head back to Delhi on Saturday 27th for our return flight to the UK via a short 1 hour stop in Amsterdam where we will have the opportunity to say Adios to our international friends. I’m looking at booking a train journey for the return to Delhi just for the experience. We arrive back in the UK on the Sunday morning and hopefully everyone will be home for their Sunday Chicken Jalfrezi…..sorry Sunday roast…..which will just taste so so bland. At the time of writing this I have a couple of UK patients and possibly 2 Irish lads on board. When I checked the flight prices earlier today they were £440, an absolute steal! I could probably take a maximum of 7-8 patients with me depending on their graft requirements of course so I think it won’t be long before the trip is fully booked up. 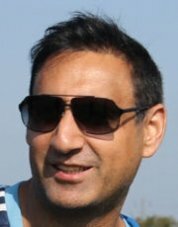 So if any of you are considering hair restoration surgery with Dr Bhatti or perhaps finding the whole travel to India thing a daunting prospect, then please get in touch, my details are below. Dear all, The following video gives a complete walk through in the footsteps of a UK patient's surgery with Dr Tejinder Bhatti at his new purpose built Darling Buds Clinic Hospital in Chandigarh, India. It explains in detail how the transplant is done and the aftercare provided. I hope it will clarify many aspects of our FUE surgery especially for all you new guys and the lurkers amongst us. A special thanks goes out to the patient who happens to be a professional barber from the UK. As always, we will be delighted to answer any questions. Getting a HT when young - a delicate issue. Thousands of patients in their mid to late 20s have hair restoration surgery for more or less the reasons you describe above.Why hide away wasting the prime years of your life when you should be out there full of beans making things happen and laying down your life's foundations. The most important thing to take into account is that hair loss is progressive and any surgery at this age is very likely to not be your last. Therefore patients in their 20s need to look at the big picture and the road that lays ahead. It's best to first consider all alternatives to surgery first, - a different style to disguise the balding areas perhaps - use of fibres to thicken the appearance of your hair thus disguising any thinning areas. - going down the medical route to help recover thinning hair and delay any future balding. If surgery is a must then its best to stick to a conservative surgery which will make an aesthetic difference enabling you to move on or enable you to use the above options to help you move on. Much will depend on the available grafts you have in your safe donor. The fewer the availability of grafts the more a conservative approach you must take. As usual look at pointers such as the balding patterns of older relatives to determine where you will end up if there is no intervention. Most importantly, choose the right surgeon for you, most of you will only get one real good chance. MizterKewl, Judging by your pics, I would suggest you are a definite candidate for the no shave technique however the donor hair at the back will be best shaved but you have the style to carry that off no problem. I would suggest approx 500 grafts for each temple. Also, I take it you aware of the risk of high transection in extracting Afro-Caribbean hair grafts due to the nature of the curl under the scalp surface. Also you should be aware that successfully grown out transplanted hairs will cover more area than straight hair, again due to the curl. Many patients can get away with the no shave technique if the graft recipient area is restricted to an area that can be covered by existing hair during the growth phase. E.g. the temples as you mention, the hairline if there is ample hair further up to hide the recipient area (fringe) and the crown through strategic styling. It's when the area to implant is bigger, then no shaving becomes problematic. Also most surgeons will say that 1500 - 2000 grafts is the maximum for no shave otherwise the donor area will become uneven. If more grafts are required in a number of areas then it will be necessary to shave the donor area in order to extract more grafts evenly but depending on the areas of placement it may still be possible to not shave the entire head. If you post pictures then we can offer you better guidance. As a patient representative for Dr Bhatti I find it very frustrating that one of our patients cannot just simply tell his story without the constant unhelpful intervention of posters who favour other clinics. For the umpteenth time you only have to refer to my own thread written as a patient nearly 5 years ago to appreciate that and frankly nothing has changed since. In the end the forum misses out. You may have noticed that barely any of the UK guys I send over post their stories on this particular forum. The reason being I advise them not to because I feel the negativity that their posts will invariably attract from posters affiliated with rival clinics may put seeds of doubt in their heads. I need my patients to stay in a positive frame of mind. Having sad that I hope everyone will now think twice about making posts detracting from HLPToronto's own story. It’s his thread, respect it! Well, that's a bit earlier than expected, usually the haters at least wait to see the surgery pics. HLPToronto, Just wanted to add a thanks for your detailed reasoning in choosing Dr Bhatti. I'm looking forward to my continued involvement in your journey, I think I'm more excited than you! Result better at month 9 vs month 12 ??? Hi SM90, I was under the impression that your hairs had not grown back at all after shedding. If they have then matt3480 has offered you a very good explanation as to what could be the issue here. What do you think? I would have thought you should be OK using Toppik at this point washing it out each evening. But first I would advise you to clarify with your doctor the reasons why he opposes its use. Ultimately you have to respect the advice of your doctor. Was you previous surgery where you used Toppik after 2 weeks a success? Hi Obaid, You are 25, your whole scalp going back to your vertex shows an aggressive amount of thinning for your age and I would guess you are heading for a high Norwood, 6 or 7 perhaps. It is possible judging from your sides that you have some diffuse thinning but it may just be harsh lighting already pointed out. The only thing in my opinion that will help slow down and somewhat recover this rapid loss is Finasteride which you are reluctant to take. Once its gone its gone. If the whole visibly thinning area was to go you will need 5- 7000 grafts to give the "illusion" of a full set of hair. Your donor area will be fully utilised and will be left rather thin to the extent that you may have to have SMP in this area to disguise the thinning. You do have the option of using body grafts to compensate for shortage of scalp grafts. If you decide to go initially down the FUT route then it is likely that your scar will be visible after the surgery with short hair or once you have had further surgeries to fix further progression of hair loss. This is the harsh reality. You need to understand that without meds you need to be prepared for multiple procedures and have realistic expectations of what you can possibly achieve in the short and long term. You could have a dense head of hair initially following surgery but I think you will face an uphill struggle in maintaining this density long term unless you have an abundance of decent body grafts that you are prepared to use or you reconsider going down the medical path to help sustain your native hair. How do you rest with a hair transplant on the donor area? I see your point there Corbinite. It's quite rare as already mentioned in your previous thread to have grafts implanted in the donor area. I think you are going to have to improvise with this. The first night following the surgery you are going to have to sleep upright with your head forward, you could do this by doubling up on the flight pillows to create that buffer between your donor area and the back of the chair to ensure you don't squash/dislodge the newly implanted grafts. For subsequent nights you could again sleep in the chair using the same technique or you could play about with kids swimming rings to see if you can use these to sleep without rubbing on your implanted grafts. 2-3 nights of careful hardship and then you should be OK to relax a little more as your grafts will be firmly embedded. It's probably wise to stay a few days post surgery before flying back. Number of grafts required and potential outcome - your opinion? Hi Jhonny, At 38, you should consider going back on Finasteride (if you had no side effects previously) to try to sustain your native hair. Your last picture in particular shows lots of hairs that are worth fighting to keep. I would recommended a procedure of 4500-5000 grafts to rebuild you a mature age specific hairline at the level where your tuft is, some minor redefining of your temple points and strengthening of your midscalp all the way back to your vertex. This should make a dramatic difference to your appearance and should give you the "normal" look which I take it means walking into a room and being recognised by complete strangers as a person who is not bald/balding. You do have the option of going for a second procedure a year or more down the line to increase the density if need be. This is quite common for guys with similar extensive balding patterns and in your case would probably be another pass of approx. 2000 - 2500 grafts over the previous implanted areas. I remember a few years back feeling the same way, I had a similar pattern to yours which now seems just a distant bad dream. If you follow the same path as me, it will cost you about 6,500 USD for a 4500 scalp graft procedure. All the best. Hi Obaid6727, Both myself and Dr Bhatti have tried to contact the patient but unfortunately the email we have for him just bounces back. The procedure was 7 years ago so I would guess like many past patients he's put his hair issues to bed and moved on with his life. Hi Lennney, Great write up, it sounds like you had a great experience. It doesn't end there, feel free to contact myself or other members of the team anytime. Jay Ell, Jhonny, if you guys have any queries, then again, just ask. All the best to you Lennney, I'm looking forward to see how you progress. It's been 13 months since your surgery so I can understand your disappointment. Try to post some pics of your scalp pre-surgery alongside what it looks like now along with the number of grafts implanted. This will help judge your result thus far. Also your shedding hairs still have time to grow back, try to be positive.